Formerly known as The Book Catapult, this is now simply the blog of The Book Catapult – an actual independent bookstore in San Diego, CA! If you are a faithful reader of this website, you’ve no doubt realized that it has gone somewhat dormant over the last year or so. For that I apologize, especially if you’ve been jonesing for a bit of literary snark and have found the same old posts at the top of this page. BUT I have a good reason for this abandonment and I think you’re going to dig it. The Book Catapult is transforming into an actual bookstore, my friends. With walls, tables, bookcases, and lots of books. A true “brick-and-mortar” bookstore. My wife, Jen Powell, and I are taking over ownership of an existing boutique shop in our San Diego neighborhood of South Park. 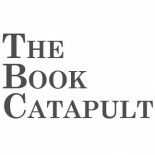 The store is called the West Grove Collective at the moment but we will be rebranding it as The Book Catapult. Right now the West Grove has about half of their space devoted to bookselling, with the rest being a mix of gifts & stationery with several vendors selling their own brands of clothing, home goods, and art textiles. Our plan is to turn the main 1000 square feet into a 100% bookstore, with a healthy emphasis on Catapult-friendly fiction & nonfiction plus a rockin’ kids section. And plenty more, of course. The vendors in the store now will still be bringing their eclectic mix of products to a Book Catapult Boutique within the space. We are set to take ownership on October 1st. We’ll be closed for a few days while we get things ready, casually opening back up on October 5 with a grand opening of sorts on Saturday, October 7th during the Fall South Park Walkabout. If you live in San Diego, do come on by that Saturday evening starting at 6:00pm (or before, of course) – we will have music, drinks, food, and a shitload of books. We are also planning on rolling out an Indiegogo crowdfunding campaign to help with some of our startup costs – please stay tuned for more on that front. We would love your support, especially if you’ve enjoyed this ridiculous blog for all these years. As for the Book Catapult website, it shall remain, have no fear. We are planning on integrating the blog portion into our new site once we get all that together. Same ol’ snark, just with a fresh new look. I’m also keeping my job as a publishing rep for Ingram Publisher Services, by the way. I’ll handle most of the book buying for the Catapult, but Jen will be running things day-to-day for the most part. Thank you for your readership all these many years, friends. We truly would not be doing all of this if we didn’t believe there was a wonderful community of fellow readers out there in the world. Thanks for making me always feel connected to that community. This is a great thing for San Diego book lovers, Seth, a new bookstore operated by book lovers and old-style booksellers! I will be by to see you and Jen in your new shop. Congratulations! Dennis and I are over the moon about your new endeavor. So happy for both of you and hope to stop by the store soon. I live about 3 blocks from West Grove Collective! I’m a reader and an author. You can bet your life I’ll be by. I’ll be the one with the dog. Oh wait, it’s South Park–that’s everyone. Welcome to the hood! I also live about 3 blocks from West Grove Collective which has been such an asset and welcoming place for readers and writers, fostered by Ann Mery. I look forward to dropping by and meeting you and supporting this independent bookstore. Best of luck in this endeavor. I, too, live roughly about 3 blocks from West Grove Collective. I hope the store has a few philosophy books. Good luck. Looking forward to checking your place out!! This entry was posted on September 26, 2017 by bookcatapult in Uncategorized. The Catapult Notable List 2014 preview night!